On Thursday, August 23, from 9 a.m. to 3 p.m., Wright State University students will move onto campus in a collaborative effort that takes only a few hours. Each year, student, faculty, staff and alumni volunteers help students move in to their new home on campus before the fall semester. 2018 marks 27 years of Move-In Day on campus. Students will move into 29 residence halls including the Honors Community, The Woods, on-campus apartments and Hamilton Hall. 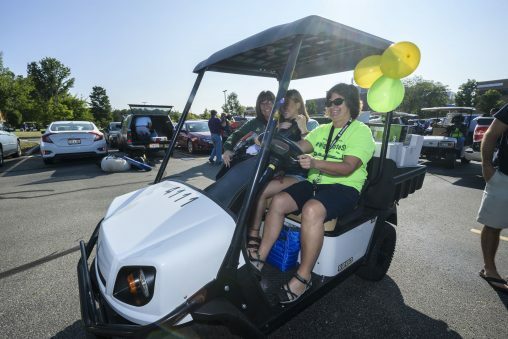 To help, 500 student, faculty and staff volunteers will be there with 110 golf carts to transport students’ belongings to their residence hall. Living on campus, especially for first-year students, can help them get accustomed to the college life, as well as orient them to the services that Wright State offers. Residents will move into Hamilton Hall, the Honors Community and the Woods on August 23 and into apartments such as Forest Lane, College Park, University Park and the Village on August 25. Students are encouraged to bring items like seasonal clothing, extra-large twin sheets, a mattress pad, pillows and comforters, rugs, an alarm clock, a bathmat, towels and other toiletries, a clothes hamper, an umbrella, a computer, cooking utensils and plates, cups and silverware. Parking locations vary depending on the student’s residence hall. Those staying in Hamilton Hall should park in Parking Lot 4 and check in at the Hamilton Dispatch Tent. Honors Community students should enter through the first College Park gate on Zink Road and check in at the Honors Dispatch Tent. 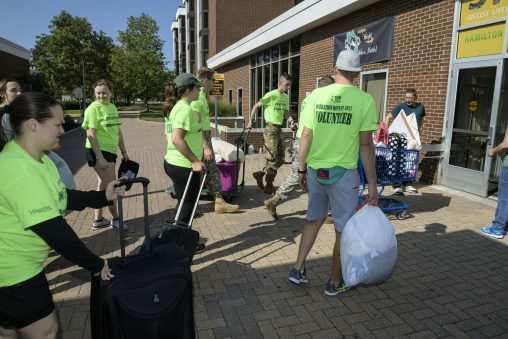 Bertsos said that Move-In Day is one of Wright State’s biggest traditions. Visit https://www.wright.edu/residence-life-and-housing/campus-living/operation-move-in-2018 for more information about Operation Move-in 2018.